What Kate does...I am going to separate my comments between island and flash-sideways, for the sake of continuity and flow. We start with Sayid regaining consciousness in the Temple, and Sayid telling Kate that he plans on running. I have to say, this plot function is getting a bit old...I've seen this movie before. We see that Sayid's wound is closed. Therefore, the waters of the island have healing powers. We have seen before that the island has healing powers - i.e. Rose and John. Is it super-concentrated in the water? Sawyer gets a gun, and decides to leave. He has become the ultimate nihilist. He instructs Kate not to come after him. Gee...what will happen...this is What Kate Does...she doesn't listen. Dogen has Sayid strapped down in a manner that reminds us first of Danielle Rousseau having strapped Sayid down in the first season, but also it looks a bit like the torture scene from The Princess Bride. Dogen blows a bit of the mysterious dust over Sayid - the dust that is supposed to repel Smokey. Nothing happens. Dogen straps electrodes to Sayid's chest, and starts a-crankin. A very poignant moment - Sayid the torturer looks at Dogen and asks "why are you doing this?" He takes a hot branding iron and seemingly disinfects the wound. Lennon, the hippie tells Sayid that it was a test. Note - there is a baseball on his desk...this has got to be a tribute to Deep Space Nine, as Benjamin Sisko famously had a baseball on his desk! Jin and Kate go out into the forest with two Others, looking for Sawyer. Aldo admonishes Justin when Justin is about to tell Jin and Kate about the Ajira flight. He admonishes Justin again when he is about to tell him about Rousseau being dead for years. Aldo then reminds Kate that she knocked him out when she escaped from the Others' camp. She takes the opportunity to do it again. Sayid is brought back to Jack, Hurley, et al. He tells them that they tortured him. Why? "I don't know. They didn't even ask me any questions." Absolute definite reference to Empire Strikes Back, when Han Solo is returned from his interrogation session. 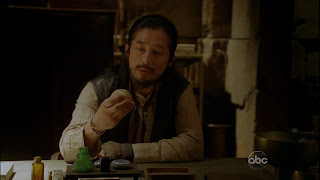 Dogen and Lennon tell Jack that Sayid is infected, and that he has to give him a pill, because Sayid needs to take it willingly. Jack tells this all to Sayid. Sayid says he implicitly trusts him, and so if he wants him to do it, he would. Kate finds Sawyer in his old bungelow on the Others' kibbutz. She admits to Sawyer that her purpose for coming back was to find Claire. He admits to her that he wants to be alone. Jack confronts Dogen and Lennon. They tell him that they believe Sayid has been claimed, as has his sister - Claire. Kate gets into the cab with Claire. The cab driver, it should be noted, is David H. Lawrence, who portrayed Doyle on Heroes. They get delayed by a clumsy Dr. Arzt (have I mentioned before how funny it is that Arzt is German for 'doctor'? So, Dr. Doctor...can't you see I'm burning, burning...Thompson Twins? Anyone? Kate ditches Claire, and later realizes she has Claire's baby items. She feels intense guilt, and decides to get the baby items back to Claire. This plays very well on the connection that Kate has to Aaron. Kate takes Claire to the birth parents that she was going to give the baby to, and there finds out that the potential adoptive parents have split up, and the mother doesn't want the baby anymore. Kate goes with Claire to the hospital, where her obstetrician is Ethan Rom, aka 'Dr. Goodspeed'. Well, we now know for sure that the bomb going off in 1977 drastically altered the timeline. With the bomb going off, and the Others leaving the island, there is no recruiting of other "Others" to come to the island, hence Ethan is never on the island. Neither is Juliet, etc. However - the lives of everyone are still intertwined.